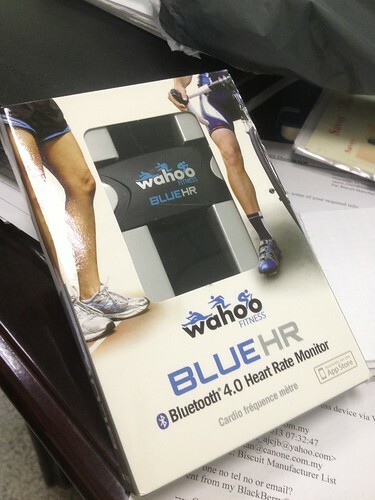 It's the Wahoo heart rate monitor that uses Bluetooth 4.0 instead of some proprietary network or ANT+. It was relatively cheaper since it doesn't have a receiver watch. It wasn't a big problem since I don't stare at the watch every step of my run. The signal goes straight to my phone where notification, at regular intervals, is via audio through the earphones. The best part? Signal transmission is consistent. No more dropped signals or ridiculous heart rate readings. I was glad to be finally rid of the stupid Polar HRM which I gladly gave to the Towkay Neo of Lucky Bar. I figured it shouldn't be a problem for her since she runs less than 5km. When I first brought it to her bar for her to try it, it didn't work properly. Her heart rate was 205 bpm which obviously was incorrect. I figured it's probably the battery in the transmitter running out of juice. I have yet to hear from her if she has had the battery replaced. I hope it works.